The sauce for these delicious and spicy nuggets was created in Buffalo, New York, hence the name. After refrigerating the prepared chik’n seitan nuggets as recommended, drain any excess broth they may have been stored in. There’s no need to pat dry as moisture will help the flour adhere better. Combine the flour, salt, paprika and garlic powder in a zip-lock bag. Add the nuggets and shake well to coat evenly (a light coating is all that is needed). Pour ½-inch of oil into a large deep skillet or wok and place over medium-high heat until the oil appears to shimmer. Add the nuggets to the skillet and fry them until golden brown, about 3 to 4 minutes per side. Remove to a plate lined with paper towels. Melt the vegan butter or margarine in a bowl in the microwave or in a small saucepan and whisk in the hot sauce. 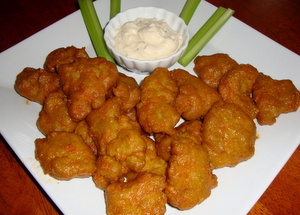 Toss the nuggets in the sauce mixture until evenly coated and serve immediately to prevent them from getting too soggy. You can also serve the sauce on the side. Serve with celery sticks and Chunky Bleu Cheese Dressing or “Buttermilk” Ranch Dressing. If you need to reheat the nuggets, gently warm them in the oven – do not microwave or they will get soggy.